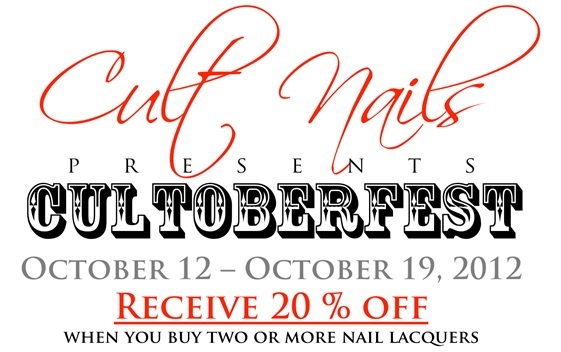 Fashion Polish: October is Cultober : Cult Nails sale and giveaways! October is Cultober : Cult Nails sale and giveaways! If you follow me on social media or read Maria's blog then you must know that Cult Nails has been hosting many giveaways this month. Beginning Friday, October 12, going through October 19, all Cult Nails Lacquers will be on sale! When you order $20.00 or more (must be $20 worth of Nail Lacquers... discount does not apply to treatments, nail art, nail files, or clothing) you will receive 20% off those lacquers when you check out and use coupon code "CULTOBER" (no quotes). Be aware that you will enter the coupon code AFTER checking out through PayPal. Following the PayPal screen, you will be routed back to cultnails.com to finalize the sale, enter the coupon code, and the discount will be applied! Now is the time to stock up on your favorite Limited Edition colors before they're gone for good! There is no limit to the sale! As always, there is free shipping for all orders over $75.00 after applied discounts! Happy shopping! Also, be sure to check out our blog, Facebook, and Twitter accounts to keep up with giveaways! We're giving away over $900 worth of Cult Nails products this month, don't miss out on your chance! And don't forget to check out my participation in the Cultober Fest on the 22nd! I'm so excited!!! ordered my first 2 nailpolish from Cult! Im super duper excited! !